His Holiness Dr. Syedna Mohammed Burhanuddin was the 52nd Dai al-Mutlaq and spiritual leader of the one million strong Muslim Dawoodi Bohra Community. According to Dawoodi Bohra faith the Dai is vested with the absolute authority of the Imam who is in seclusion. He lead the community for 51 years. Syedna Burhanuddin was the eldest son of the 51st Dai al-Mutlaq Syedna Taher Saifuddin. Born on the 20th of Rabi ul Akhar 1333H (6th March 1915) in Surat India. He was educated and trained by his father in the traditions and philosophy of Fatemi Dawat. He also memorized the entire Qur’an. Syedna Burhanuddin was elevated by his father Syedna Taher Saifuddin to the lofty position of ‘Mazoon-e-Dawat’ in 1352H (1934) and also appointed his successor on the same day. He was awarded the title ‘Mansur-ul-Yaman’ upon his return from a historic trip to Yemen as Mazoon-e-Dawat and his foundation of the qubba of the 3rd Dai al-Mutlaq, Syedna Hatim b. Ibrahim. Syedna Burhanuddin was always with Syedna Taher Saifuddin until he passed away on the 19th of Rajab 1385H (12 Nov 1965). As Dai Syedna Burhanuddin took the first misaaq (Oath of Allegiance) of his followers on 17th Shaban 1385H (10 Dec 1965) in which he appointed Syedna Khuzaima Qutbuddin TUS as Mazoon-e-Dawat. Earlier in the day he also appointed him privately as his successor. Syedna Burhanuddin was the first Dai to serve the Dawat over the age of 100 years and the second in the history of Dawat to serve as Dai for over 50 years. In these years Dawat gathered great economic strength and a myriad of major construction projects were completed. He is credited for beginning a great revival of Fatimid architecture. Rozat Tahera, the mausoleum of his father also built in the Fatimid style, was Syedna Burhanuddin’s first major undertaking. The towering white marble structure is unique because of the engraving of the entire Qura’n on its inner walls. The Jamea al-Anwar Masjid, originally built by the Fatimid Imam al-Hakim bi Amrillah was, at the time, the largest reconstruction project the community had undertaken. Syedna Burhanuddin has also built and dedicated the Mausoleums of Sayyida Zainab binte Ali and Sayyida Ruqayya binte Ali in Cairo, the zarih of Ru’us al-Shuhada’ and mashhad Rasul Husain in Damascus, the zarih of Ja’far al-Tayyar in Muta, Jordan, and the zarih on the Mihrab of the Kufa Masjid where Maulana Ali b. Abi Talib was martyred. Hundreds of Masjids have been built in Syedna’s tenure as a result of the revival and blessings of the construction of Jamea al-Anwar. Syedna recently also undertook the renovation of the Great Masjid of Kufa. The reconstruction of Saifee Hospital was also a major undertaking and the building stands as a landmark of Mumbai. Syedna Burhanuddin travelled extensively and tirelessly to visit towns and cities where his followers reside up until he was 100 years old. He also gathered followers in their hundreds of thousands for the Ashara Mubaraka Muharram sermons every year. Syedna Burhanuddin received several honors and awards from universities and governments. Soon after Syedna Taher Saifuddin’s wafat Syedna Burhanuddin travelled to Cairo for the inauguration of the zarih in Rasul Husain gifted by Syedna Taher Saifuddin. The al-Azhar University – established by the Fatimid Imam al-Muizz – honored Syedna with a Doctorate in Islamic Philosophy. Later Ali Garh Muslim University also bestowed the same honor. Some years later the University of Karachi also bestowed the same honor when Syedna dedicated the universities Technical Institute. He was also the chancellor of Aligarh Muslim University for one term. Syedna Burhanuddin also received honorific titles and medals from the governments of Egypt, Jordan, the UK and the USA. 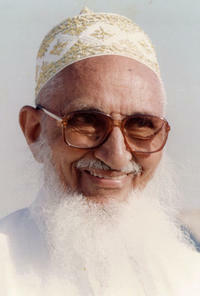 Syedna Mohammed Burhanuddin RA was also posthumously awarded the Padma Shri Award, one of the highest civilian awards conferred by the Indian government. This was awarded to Syedna Burhanuddin RA for his ‘distinguished service’ to the community, the country and humanity at large.